Recognized throughout the midwest as Ohio’s premier summer camp since 1959. Falcon Camp has been selected in “50 Amazing Camps in USA” and chosen as the “Coolest Camp in Ohio”. Falcon offers a beautiful lakefront setting, talented staff and wide variety of activities. Boys and girls ages 6 – 16 choose their own schedule within a general framework. Daily activities are separate with planned coed events. Horseback riding, sailing, swimming, riflery, tennis, drama, archery and more. Falcon has a strong reputation for making sure a camper’s first overnight experience is positive. The non-competitive environment is inviting to new campers while our awards system challenges more experienced campers. The 1:4 staff/camper ratio allows individual instruction and attention. Most of all it’s great fun! 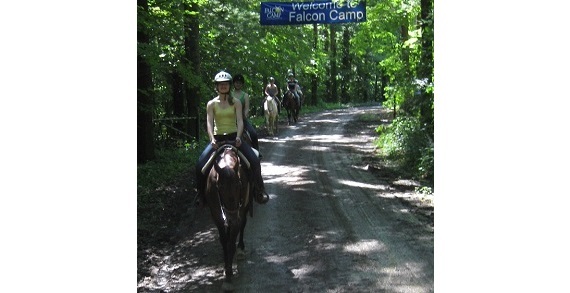 Falcon has a special 'Young Adventure' intro program for campers ages 6-10. ACA accredited, many references available. Falcon is an outstanding opportunity for fun and learning. Visit www.falconcamp.com.